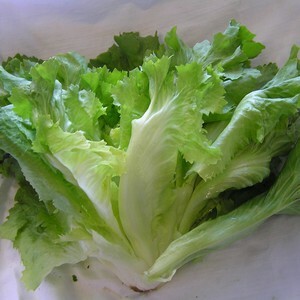 Escarole is a type of endive whose leaves are wider, slightly paler, and less bitter than the rest of the endive family. Like radicchio, kale and chard, escarole is a hearty green that grows well later in the growing season. One interesting thing about escarole is that its middle leaves are less bitter than the outer leaves because they haven't been exposed to sunlight. (There are even some farmers who cover the plants with paper, depriving them of sunlight and reducing their bitter flavor.) Escarole is high in folic acid, fiber, and vitamins A and K. It's also super versatile- we like to toss it into a soup or mix it into a green salad.